When troubles arise in the world of Harry Potter, wizards cast charms. Rich celebrities, on the other hand, summon fleets of very well-paid lawyers. Hence J.K. Rowling has just sued the Daily Prophet Daily Mail for libel. Expelliarmus! I don't think J.K. Rowling and the Frankly Quite Hurt Church Ladies was the Casual Vacancy followup anyone wanted. Her court filing states that she had not "accused her fellow churchgoers of 'stigmatising' or 'cruelly taunting' her." Instead, "she had referred to a single occasion involving a woman who had visited the church one day whilst she was working there." 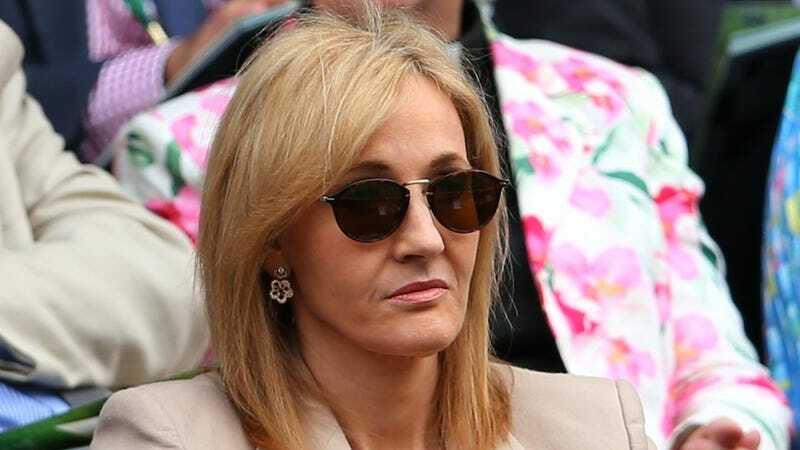 It further states that a woman quoted in both versions of the story had neither been "upset" nor "bewildered" and claims that the Mail had been "misleading and unfair" by accusing Rowling of "making knowingly false statements". The Daily Mail did not respond to the Guardian with a comment. Let's hope she writes a novel about a newspaper next.